Economize R$ 51,24 (32 %). Comprar eBook Kindle. 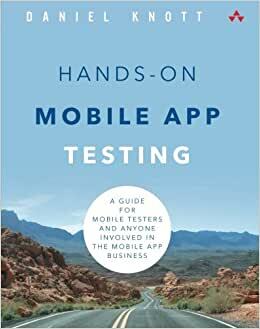 Comece a ler Hands-On Mobile App Testing no seu Kindle em menos de um minuto. Daniel Knott has worked in software development and testing since 2003. After launching his career as a trainee at IBM, he studied computer science at the University of Applied Sciences in Wiesbaden, Germany, where he quickly developed a passion for testing. He has worked at companies in diverse industries, with responsibility for testing Web, desktop, and mobile applications. He has also developed fully automated testing frameworks for Android, iOS, and Web applications. Knott is a well-known mobile expert, a speaker at conferences throughout Europe, and founder/organizer of two local software testing user groups. He blogs on software quality at adventuresinqa.com. Great book! I enjoyed reading each chapter of the book and I also shared it with the rest of my team.